On 2 July 1990, a truck smashed into the back wall of the German embassy in Tirana, creating an opening in the wall that served as a gateway for 3,000 Albanians to enter the building and seek asylum. Now the cabin of that very truck has made its way back to the embassy, this time as a commemorative art installation. Titled simply The Wall, the installation was the brainchild of art activists Gjergji Islami, Ana Pekmezi and Eljan Tanini to mark the 27th anniversary of driver Ylli Bodinaku ramming the back of his truck into the embassy. But Mr Bodinaku also had a key part to play in immortalising the Czechoslovak LIAZ (Skoda) truck. “[...] the symbolism of this Skoda displayed here is special. I repaired it after it was brought to me ruined. 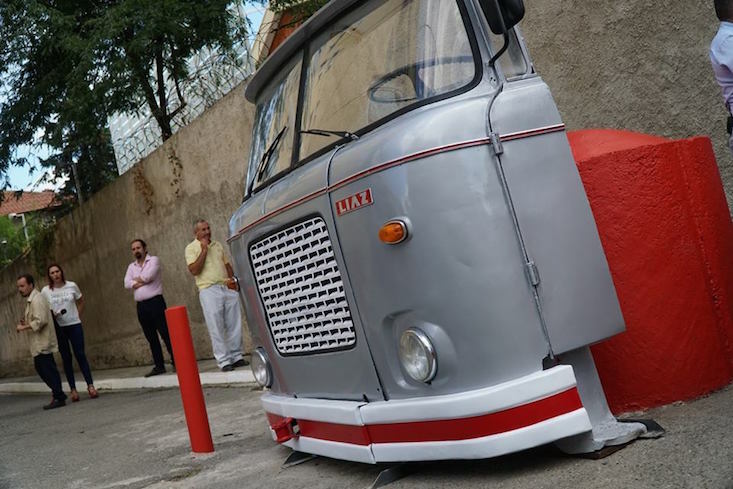 I cut, repaired and painted it the same way as the original one,” Mr Bodinaku told the local press, according to the Tirana Times, speaking of how he “fed [his] children with this truck” during the reign of communist leader Enver Hoxha. Following Mr Bodinaku's actions, 3,000 Albanians resisted for 12 days at the German embassy, all of whom were allowed to leave for Germany on 12 July as the result of negotiations between the German and Albanian authorities. “The Wall art installation commemorates both this historic date and transmits to the younger generations their predecessors' strong desire for freedom and democracy,” reads a statement from the German embassy. According to Balkan Investigative Reporting Network (BIRN), the installation forms part of a broader initiative by the artists, who propose painting the high wall that surrounds the principal block of embassies in red and creating further installations. “The absurdity of [the wall's] presence is a signal of the barriers of the past that still shape our life. We aim to use it to regenerate the urban space by creating an open-air museum,” Islami told BIRN.